This Pro Bicycle Repair Stand is really convenient for maintain your bicycle in any position which is convenient for you to work. There is another special design, repair the head can be 360 degrees Rotation, to scale up and down, four corners can also shrink, is a very convenient product. The bicycle repair stand can hold the max weight about 66lbs with the heavy duty clamps. Hongsen Bicycle Co., Ltd. is located in China Bicycle Parts Base. 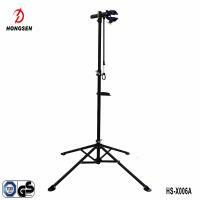 Ours have 20 years of experience in designing and manufacturing about bicycle spare parts, Hongsen specializes in producing quality kickstands, carriers,workstands, and parts of the bicycle. The company has advanced production line and testing equipment also with a strong professional team,380 workers,30 technical personnel and strong technical ability, independent research and development ability. Our products are very popular and loved by the customers deeply in its scientific design, advanced technology, changes in a variety of styles.Our goods have marched to Europe and America,South East countries and areas, and in China, we hold stable sales in over 20 provinces and cities. We set up a research and development international marketing center in Beijing of 2014, for the global customers with one-stop bicycle parts supply service. Our company put the products quality on first, according to the idea of customers first, quality best, service first, reputation first to Strengthen enterprise management and quality inspection. We are looking forward to your cooperation with your coming home and abroad, Welcome to your visiting our factory, talking about our business. Let’s make the excellent future hand in hand. A: Since we are factory, our policy is that bigger order quantity, the lower quotation will be offered. So we will give you discount on your order quantity. Q: Do you accept OEM or ODM orders? A: Yes, of course. And the sample will be charged, not free for you. Q: How is your design team?